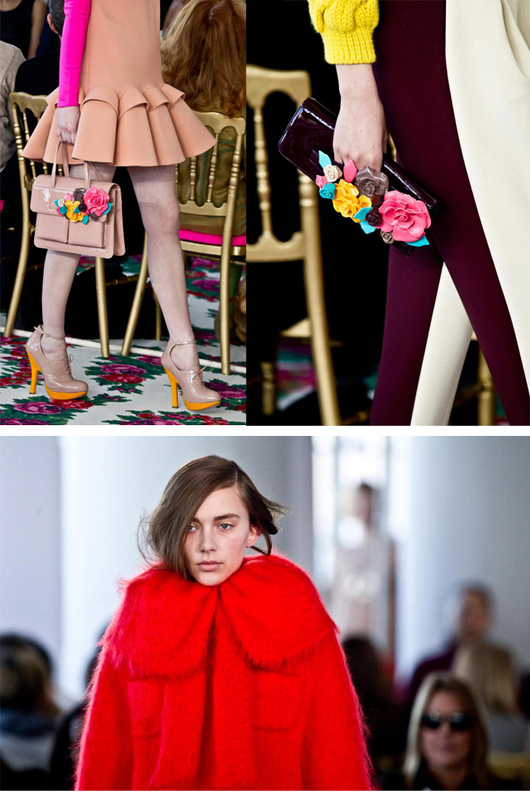 What I love about DELPOZO FW13 show, was the trends that Josep Font, the creative director, showed. DELPOZO, is an amazing brand founded by the Spanish designer Jesús del Pozo, in 1974. Let´s talk about some of the trends. #1 Color on Color. There were many great combinations on the looks during the show. Pink and white? Great. Burgundy and Carnation pink? Even greater. #2 Flowers. They are making a comeback, apparently. Did they even went out? #3 Flowers on shoes and bags. My favorite trend on this show. Those red shoes, wow! #4 Oversized. We have seen this trend on many brands. I quite don´t get it at first, but then i fell in love with the oversized coats and sleeves. Kinda spanish. #5 Great carpet. Ok, this is not a trend, but i loved the flower carpet. Among the guests, were Olivia Palermo, Lauren Santo Domingo, Eugenia Gonzalez, Yaz Hernandez, Gabriel Rivera Barraza, Brenda Diaz de la Vega, Alexis Zambrano, Peter Davis and Dany Wong. Plus, DELPOZO is available at Moda Operandi, super exclusive and is available immediately after the show. With great reviews and the support of an exclusive website like this, we can expect a lot from this spanish brand.